Star by Julien McDonald Red Bodycon Dress. Excellent dress for party. Star by julien macdonald size 18 Dress. Condition new with tags. Pink and black lace. Underdress us polyester then lace look on top. Quality dress by Star Julien Macdonald (Debenhams) in a softy stretchy fabric lined dress. The other shoulder is sleeveless. Dress is ruched and stretchy for a comfortable fit. Leopard Print Maxi Dress size 12 Star by Julien MacDonald Debenhams Stretch. Fantastic condition. Please see my other items. Dispatched with Royal Mail 2nd Class. Star by julien macdonald size 18 dress. Condition is Used. Dispatched with Royal Mail 2nd Class. Ladies black cocktail/party dress size10 ( Euro 38 ) Plenty of ruches and frilled hem. Could be worn strapless ( has stiffeners in bodice ) or there are detachable thin straps if needed. Fabric 60% polyester 40% polyamide. Black frilled rose at centre front. Shocking pink full lining. Full zipped back opening. Designed by Julien Macdonald for Debenhams. Approx 70 cm from top of back zip to hem. Excellent condition. ( as far as I can remember it has never been worn ) Fun dress ! star by julien macdonald dress size 10. Beautiful multi coloured dress with sequins on front. Looks stunning on. Very flattering shape. Perfect for parties or holidays! Very good condition. Ladies 12 leopard print maxi bodycon dress Star by Julien Macdonald at Debenhams. Perfect for party/cruise/wedding/holiday. Lovely black beading round neckline. Fastens with two small buttons at back neck. Quite stretchy to give perfect fit. Vgc from smoke and pet free home. It is in a stretchy polyester and elastane mix in black with a large pink floral print. It has a low V neckline - I have used a pin so neckline is not as low. It is labelled a size 16. Waist area is 34" with more stretch. White Dress - Star by JulienMacd size 12. £60. Stunning White Dress - Star by Julien size 12. Cost £60, new with tags. Has drapes front so very flattering and silver detail. From a smoke and pet free home. Please have a look at my other items, happy to combine postage. Star by Julien MacDonald - Black Beaded Neck dress size 16, knee length. Condition is Used - although only worn once. Will be dispatched with Royal Mail 2nd Class. Any questions please ask. 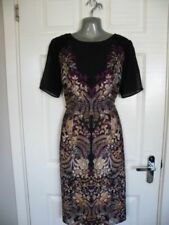 STAR BY JULIEN MACDONALD black oriental floral pencil wiggle dress size 8 eu 36. Condition is Used. Dispatched with Royal Mail Signed For® 2nd Class. BNWT Star By Julian McDonald Cocktail Evening Party Dress Size 12 RRP £85 !!! Stunning dress, sleeveless with peplum waste line. Lace detail with embellished neckline suitable for all occasions. Red Body Con Dress, Star by Julien Macdonald, Red Ombre, Size 14, Worn once for 6 hours at a dinner party. Condition is Used- 1very small snag as seen in the picture. GORGEOUS White Dress Star by Julian MacDonald size 16 BNWT RRP £60. Party/Prom. Condition is New with tags. Dispatched with Royal Mail 2nd Class. Star By Julien Macdonald. Occasion Party Wedding Pink Bodycon Dress. Size UK 16. STAR by JULIEN MACDONALD LITTLE BLACK DRESS. BEADED SECTION ON ROUCHED BAND. A ladies lovely used, approximate knee length red silk halter neck lined dress in good condition. Gold banding featuring decorative beads around the bodice underneath the chest. Elasticated back with zip and hook and eye fastening underneath the left arm. Photographs do not do this dress justice. Selling as no longer required. dark red dress size 16 elasticated waist, fully lined.. stretch fabric detailed sleeves.. as new condition. any questions please feel free to message.. Please view my other items..
star by julien macdonald size 18 Dress Bnwot. gorgeous print with butterflies looks stunning on but just not for me :( Dispatched with Royal Mail 2nd Class. Star By Julien Macdonald Black Dress Size 16 Bnwt. Condition is New with tags. Dispatched with Royal Mail 2nd Class. star by julien macdonald dress size 10. Condition is Used. Dispatched with Royal Mail 2nd Class. STAR BY JULIEN MACDONALD BLACK PARTY / EVENING DRESS. SEQUIN BUST SECTION. FLOATY SILK MATERIAL WHICH FALLS BELOW THE KNEE. Star by Julien Macdonald. Has A Pull In The Material At the Back. Star By Julien Macdonald Bodycon Dress Size 8 Ladies. Excellent condition as worn only once to a wedding. This beautiful dress is in very good condition. The beads have a distressed look, see close up photo. The colour is black. No fastening. Size on label says 12. Length from shoulder to hem is 56". Gorgeous Star by Julien MacDonald Green Floral Fitted Dress. Star by Julien Macdonald Size 14 Ladies Dress, Perfect for a Wedding or Party. Colour block gives this a very slimming silhouette Excellent Condition, only worn twice. Dispatched with Royal Mail 2nd Class. BEAUTIFUL DRESS FROM STAR BY JULIEN MACDONALD AT DEBENHAMS. LENGTH APPROX 43". IDEAL FOR A WEDDING/RACES. Sequins on the neck, fitted under the bust then soft flare. Great party dress for your Xmas season. 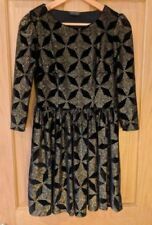 Star Julian McDonald black satin dress , size 16 , brand new with tags , knee length, with black matt studs , lovely evening dress , never worn , left it to too late to send back to Debenhams as it didnt fit. This is a new Designer at DEBENHAMS JULIEN MACDONALD ladies black & gold sparkle V neck. Size 18 UK. New without tags. Never worn as didn't attend occasion it was bought for. Beautiful dress but I can't fit into it anymore! 100% silk. With delicate beading detailing around bust & on straps. From home with no pets or smokers. Beautiful, Chic Black & Cream Shaped / Shift Bodycon Pencil Illusion Dress. STAR byJULIEN MACDONALD. A very slimming / flattering illusion dress, lose lbs and feel fantastic. Hip: sideseam to sideseam at widest part = 21". Nice black dress with beaded detail at bust . It has thin removable straps and is size uk 10. Has a few sequins missing / loose threads. 100% Nylon. The STAR by JULIEN MACDONALD Designers @ Debenhams range which is in excellent very lightly used condition. The dress is bias cut & wonderfully comfortable to wear. The dress flow gently from below the bust.